August 20, 2018 – Peoria, IL – Today, AbbVie, a research-based global biopharmaceutical company, announced a donation of $100 million to Ronald McDonald House Charities (RMHC). This donation, the largest single gift in RMHC’s history, will be used to build family-centered spaces and more than 600 new guest sleeping rooms at 32 Ronald McDonald Houses the United States. The Peoria Ronald McDonald House was selected as one of the 32 houses and will receive $3.3 million to go toward the overall $7 million build cost of the new Peoria House. “We would not be able to build the House here in Peoria if not for this gift and the ongoing support from our local community and corporate sponsors – Farnsworth Group, River City Construction, The Dax Foundation, CEFCU, Blue Cross and Blue Shield of Illinois, Marquis Energy, McDaniels Marketing and McDonald’s Owners/Operators of the central Illinois region,” stated Thompson. “Having this gift in hand means we can now move forward with our groundbreaking next month and shift our focus to the final $1.5 million needed to be raised to complete the project,” she added. 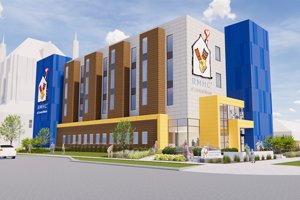 The new four-story Peoria Ronald McDonald House will be located on the corner of Spalding Avenue and NE Monroe Street and will serve over 700 families annually and provide hundreds of volunteer opportunities for the community as well as a dozen or more new jobs. Additional information about the donation from AbbVie is available online. To learn more about the Peoria Ronald McDonald House, please contact Kelly Thompson, CEO of Ronald McDonald House Charities of Central Illinois, at 309-401-2525 or kt@rmhc-centralillinois.org. SPRINGFIELD, Ill. (March 11, 2015)— Continuing its commitment to the community, Central Illinois and Peoria/Bloomington McDonald’s® Restaurants helped raise thousands during the annual “Give a Little Love” campaign to benefit Ronald McDonald House Charities of Central Illinois (RMHCCI). This year, over $211,178.51 was raised for the charity from January 22 to February 15. More than 100 Central Illinois and Peoria/Bloomington McDonald’s restaurants participated in the campaign. The money that was raised will go directly towards providing a home away from home for families of critically ill children receiving treatment at Springfield-area hospitals. To “Give a Little Love,” customers donated $1 or more at their local Central Illinois or Peoria/Bloomington McDonald’s restaurants. Customers who made a donation had their names displayed on a paper heart in the restaurant, with one hundred percent of the proceeds staying local and benefiting the families staying in the Ronald McDonald House in Springfield. The Ronald McDonald House provides a home away from home for families with sick children that are receiving treatment at one of Springfield’s medical facilities. Amenities include a private bedroom and bathroom, home cooked meals, laundry facilities and more. RMHCCI, located at 610 North Seventh Street, serves over 400 families each year and was recently renovated in 2014, expanding from 12 to 14 bedrooms and receiving needed major improvements in the kitchen and living areas. 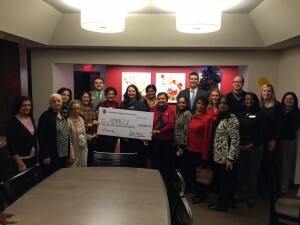 SPRINGFIELD, IL (December 18, 2014) – Vasanta Mushunuri , President of the Asian Indian Women’s Organization (AIWO), and other members of AIWO presented a $55,000 check to Ronald McDonald House Charities of Central Illinois (RMHCCI) on Wednesday, December 17. The money was raised through their recent 9th India Night held on November 14, 2014. RMHCCI has been the beneficiary of this biennial event for the last 18 years. The Asian Indian Women’s Organization was a major part of the recent “Labor of Love” renovation and expansion project of the House. They are a founding member of the Children’s Healing Corner as well as the sponsor of one of the House’s guest bedrooms. Their donations from past India Night events also enabled RMHCCI to purchase a vehicle for the charity’s use. If you have any questions regarding the presentation, please contact Development and Communications Coordinator, Johanna Moll, at 217-528-3314 ext. 148 or jm@rmhc-centralillinois.org. Pictured are members of the Asian Indian Women’s Organization and Ronald McDonald House board members and staff. SPRINGFIELD, IL (November 5, 2014) – SCHEELS and Medals4Mettle will present a check to Ronald McDonald House Charities of Central Illinois (RMHCCI) on Friday, November 7 at 11:00 a.m. The media is welcomed and encouraged to attend. The money was raised through the recent SCHEELS Treadmill Marathon held on October 25, 2014. RMHCCI is grateful to be the recipient of the Treadmill Marathon funds for the second year in a row. The check presentation – given by Amy Beadle and Marah Icenogle from SCHEELS and Scott Dahl from Medals4Mettle – will take place at Ronald McDonald House Charities of Central Illinois, 610 N. 7th Street in Springfield, Illinois. SCHEELS was also a recent sponsor of the Atrium in the newly renovated Ronald McDonald House, which re-opened to families October 17, 2014. Medals4Mettle collects medals from runners to donate to those who are battling serious and debilitating illnesses and who have demonstrated similar courage and mettle in fighting those illnesses. Medals4Mettle’s mission is to provide an opportunity for endurance athletes and runners to pay it forward by enabling the gifting and awarding of earned medals to others who demonstrate similar mettle, or courage, as they face life’s challenges. The mission of Ronald McDonald House Charities ® (RMHC) is to create, find and support programs that directly improve the health and well-being of children. Ronald McDonald House Charities ® of Central Illinois provides a temporary home away from home for those families whose children are receiving medical treatment in Springfield. In an effort to reduce stress, keep the family intact, and enhance the quality of life for families, the House provides a caring, home-like atmosphere for its guests. 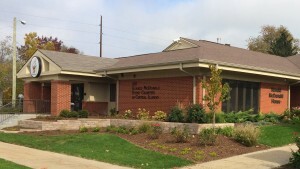 SPRINGFIELD, Ill. (October 10, 2014) – Ronald McDonald House Charities of Central Illinois (RMHCCI) is excited to announce the Grand Re-Opening of their newly renovated home. RMHCCI will be hosting a Grand Re-Opening Celebration on Thursday, October 16 with a ribbon cutting ceremony at 5:30 p.m. The Grand Re-Opening is open to the public and guests will have the opportunity to tour the newly renovated house. There will be light hors d’oeuvres and refreshments served following the ribbon cutting. RMHCCI launched the “Labor of Love” renovation and expansion campaign based on a growing need for more room in the Ronald McDonald House. The renovation included much needed updates to the kitchen and living areas as well as the addition of two bedrooms. The additional rooms will allow the House to provide a home away from home for up to 14 families at one time. RMHCCI began the renovation and expansion project over two years ago with a 17-member Renovation Committee comprised of staff, volunteers, Board of Directors, and local community leaders and led by Board President Karen Jeffers. The Committee worked with fwai architects as the design and architectural firm for the project. The Grand Re-Opening Celebration will take place at 610 North Seventh Street in Springfield, Illinois and will begin with the ribbon cutting at 5:30 p.m. Guests are asked to kindly RSVP for the Grand Re-Opening to Johanna Moll at jm@rmhc-centralillinois.org. Provide a supportive home away from home for families with children receiving medical care in Springfield. RMHCCI serves approximately 400 families per year who travel to Springfield from throughout central Illinois. For more information, visit www.rmhc-centralillinois.org, follow RMHCCI on Twitter (@RMHCCI) or like RMHCCI on Facebook (www.facebook.com/rmhcci). Ronald McDonald House Charities (RMHC), an independent non-profit 501(c) (3) corporation, creates, finds and supports programs that directly improve the health and well-being of children. Through its global network of local Chapters in 58 countries and regions, its three core programs, the Ronald McDonald House®, Ronald McDonald Family Room® and Ronald McDonald Care Mobile®, and millions of dollars in grants to support children’s programs worldwide, RMHC provides stability and resources to families so they can get and keep their children healthy and happy. All RMHC-operated and supported programs provide access to quality health care and give children and families the time they need together to heal faster and cope better. 6/9/14 Groundbreaking for the Labor of Love expansion & renovation project at our Ronald McDonald House — Read the press release! 4/7/14 RMHCCI Press Release — Springfield Jr. Blues visit an RMHCCI family at St. John’s Children’s Hospital on 3/27/14. Read the release. 3/7/14 Labor of Love Expansion, Renovation Announcement! View the Labor of Love press release & learn more about the project & how you can help! SPRINGFIELD, Illinois (June 10, 2014) – Ronald McDonald House Charities® of Central Illinois (RMHCCI) is breaking ground for its $1.2M expansion and remodel project on Thursday, June 12 from 1:00-1:30p.m. at the Ronald McDonald House at 610 North 7th Street in Springfield. The groundbreaking ceremony will be hosted by The Greater Springfield Chamber of Commerce and will mark the start of construction for the “Labor of Love: Give from the heart to keep families together” renovation and expansion project. The public is invited to attend. The “Labor of Love” project is the first-ever total & complete remodel – designed by FWAI Architects – of the 28-year-old Ronald McDonald House, and includes the addition of two guest bedrooms to serve more families. Jones-Blythe Construction Company was awarded the contract to be managed by Northstar Management Company. As part of the “Labor of Love” campaign, RMHCCI also launched the “Adopt-the-House” program with opportunities to ‘adopt’ one or more rooms of the House and sponsor its refurbishment. A new major sponsor of the “Adopt-the-House” program is CEFCU through a $20,000 Kitchen sponsorship to be announced at the ground breaking. Other committed Adopt-the-House sponsors include McDonald’s® of Central Illinois and Peoria/Bloomington through a $35,000 sponsorship of the Family Room, $2,500 from SCHEELS for sponsorship of the Atrium, and $10,000 from the Alpha Delta Pi Foundation through sponsorship of the Children’s Play Room. “CEFCU is proud to be able to support the Ronald McDonald House through a gift to the Adopt-the-House program. For families to know there is a place that provides a home-away-from-home so they can focus their attention on their hospitalized child is a great benefit for the community,” says Jeff Ambrose, Member Center Manager at CEFCU on Iles Avenue in Springfield. “CEFCU has had the pleasure of providing quality service to members in Springfield for over 17 years. And, just as we are happy to assist members and help them meet their financial needs, we are also happy to be able to support the community. This gift to the Ronald McDonald House will assist in updating the facility, and provide much-needed accommodations for families dealing with the health issues of a loved one,” says Greg Davis, Member Center Manager of CEFCU on Dirksen Parkway in Springfield. “We are proud to support the Labor of Love renovation and expansion project to serve more families. Our restaurants in central IL are supporting the project with a sponsorship of the Family Room through proceeds from the Give A Little Love campaign held in McDonald’s® restaurants January 23—February 16, 2014,” say Steve Jeffers, McDonald’s® Central IL Co-Op President and Nick Kasprzyk, McDonald’s® Peoria/Bloomington Co-Op President. The Ronald McDonald House Charities of Central Illinois is still working to raise approximately $150,000 needed for the Labor of Love project. To help, please donate online at www.roominyourheart.org or mail your donation to the Ronald McDonald House at 610 N. 7th Street, Springfield, IL 62702. The mission of Ronald McDonald House Charities® (RMHC) is to create, find and support programs that directly improve the health and well being of children. Ronald McDonald House Charities® of Central Illinois provides a temporary home away from home for those families whose children are receiving medical treatment in Springfield. In an effort to reduce stress, keep the family intact, and enhance the quality of life for families, the House provides a caring, home-like atmosphere for its guests. For more information on the “Labor of Love” expansion and renovation plans, including the “Adopt-the-House” program, please visit roominyourheart.org. WNNS 98.7 FM broadcasted live at the 18th Annual Golf Classic on 6/26/12! Mothers of NBA players came to the Ronald McDonald House in June to prepare a meal for families! Watch the coverage from WICS ABC 20! Baskets of Hope, an organization that donates baskets to parents of premature babies who are staying at the Ronald McDonald House, was featured in June in the State Journal-Register. Read more at SJ-R.com Thank you Baskets of Hope! Baseball teams in Lincolnwood & Morrisonville played games benefitting Ronald McDonald House in April. Read the feature! Thank you to all participants for your support! The House was mentioned in an article on the Young Professionals Network in April. Read the article! Ronald McDonald House was mentioned in an article for Catholic School Week and St. Joseph School. Ronald McDonald House Charities of Central Illinois was a recipient of the LPGA State Farm Classic 1/20/12. Ronald McDonald House was featured for area recycling in the Illinois Times on 1/5/12. Ronald McDonald House Charities of Central Illinois awards Dr. Michael R. Pranzatelli as its 2011 Medical Honoree during the 25th Anniversary Gala. The award was mentioned in the 11/20 edition of The State Journal- Register Business section and personnel file. Read the press release. Rae Long & Barbara Rowe, C0-chairs of the 25th Anniversary Gala submitted a letter to the editor featured in the 11/19 edition of The State Journal-Register to thank the community, sponsors, and donors for their support. View the letter. McDonald’s Owner/Operator Mary Breznay interviewed on Friday, 11/4 at WEEK TV in East Peoria to promote the House and our 25th Anniversary Gala. Watch the video. The Maddox Family was honored at our 25th Anniversary Gala on November 4. Watch a feature on their family from ABC20. Our Gala Co-Chair Rae Long was featured in a FOX scene in October with Lesley of FOX 55/27 Illinois. Watch the video on Fox. Students from Lanphier High School helped to donate computers for our House in August 2011. See the feature in the Springfield Journal-Register. Our Gala Co-Chair Barb Rowe was featured in a FOX scene in August with Lesley of FOX 55/27. View the clip. The Football Team at Lanphier High School came to Ronald McDonald House for a few hours of service in August 2011. Read more about their day at the House. Read an article about the School Pop Tab Challenge Winner for 2010-11: Chester -East Lincoln School! Congratulations!! Read an article in The State Journal-Register listing RMHCCI as place to volunteer in summer 2011.